Qualcomm’s wireless aptX Adaptive codec promises hi-res support and stable streaming | What Hi-Fi? Qualcomm wants to bring the wired experience to wireless playback. First there was aptX - a Bluetooth codec that brought CD-quality audio to wireless music. Then came aptX HD (which supports 24bit hi-res audio) and aptX low-latency, which aims to improve the synchronicity of audio and video content in, say, gaming. Now, Qualcomm has more or less taken both these features, improved robustness and audio optimisation and packaged it all in a new next-generation Bluetooth audio codec. And it’s called aptX Adaptive. Recognising that we’re living in an increasingly wireless world, where a headphone jack is an endangered species, Qualcomm is taking another step towards creating the ultimate version of Bluetooth for wireless playback. To improve robustness and deliver a ‘glitch-free’ experience, the codec takes into account the external RF environment around your aptX Adaptive device. So, when you’re taking your phone out of your pocket, or have it in a nearby bag, you shouldn’t experience any drop-outs. Furthermore, it automatically works to optimise audio depending on whether you’re making calls or listening to music. Qualcomm’s 2018 State of Play report found that 30 per cent of the 6000 smartphone users surveyed said they want to use their wireless headphones for gaming or to watch video content, in addition to listening to music and making calls - and it believes low-latency is the next battle to be fought with Bluetooth. 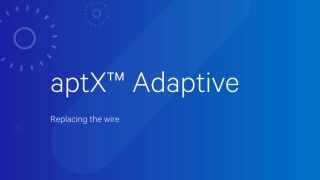 Interestingly, though, while Qualcomm will launch aptX Adaptive with 48kHz support, the codec is capable of transmitting 96kHz files wirelessly. So, fingers crossed, Qualcomm can make this a reality by achieving a robust enough connection further down the line. Replacing (but still backwards compatible with) aptX and aptX HD, aptX Adaptive will be available to manufacturers of headphones and wireless speakers from September. A version of the aptX Adaptive encoder for smartphones and tablets is scheduled to be available to run on Android P from December. With that in mind, we can probably expect to see the first wave of compatible products in early 2019.